Nobody wants their dog to get sick. We try our best to keep them healthy and happy with great food and regular vet visits. I believe that feeding Bentley and Pierre a diet of Dr. Harvey’s amazing line of food and supplements has helped them achieve their optimum health. Their veterinarian agrees and has urged me to continue with their current regiment. One of the supplements that I add to the boys’ meals is Dr. Harvey’s E-mune Boost. This is a whole-food mixture including powerful herbs that are known to boost the body’s immune fighting abilities. It can provide your dog essential amino acids, vitamins, and minerals. It is created for easy absorption and may help enhance their ability to fight disease. 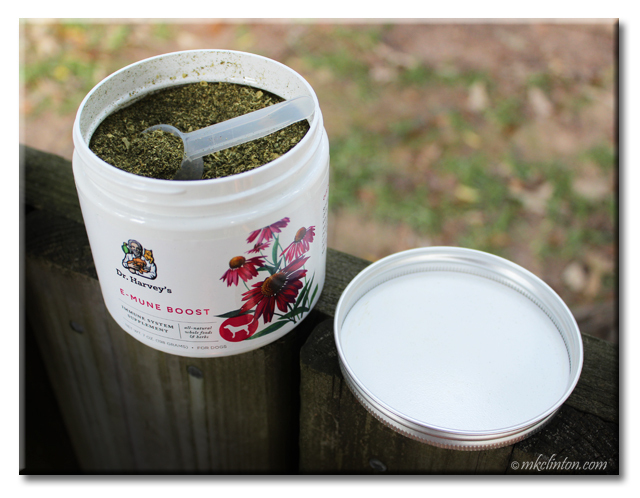 E-mune Boost is easy to add to your dog’s food; just use the scoop that is provided and measure according to their weight. There are many reasons that your best friend might need a boost for their immune system. We are currently in the process of making a number of changes in our lives and this can be a very stressful process. Dogs are notorious for picking up on our emotions and stress is not good for their systems either. Adding E-mune Boost during this time will be essential to keep them from having upset tummies and becoming susceptible to illness. Like all of Dr. Harvey’s fine health food for companion animals, E-mune Boost does not contain any preservatives, dyes, synthetic ingredients, salt, sugars, wheat or corn. It is also cruelty-free and made in the U.S.A.
Now for the great news! 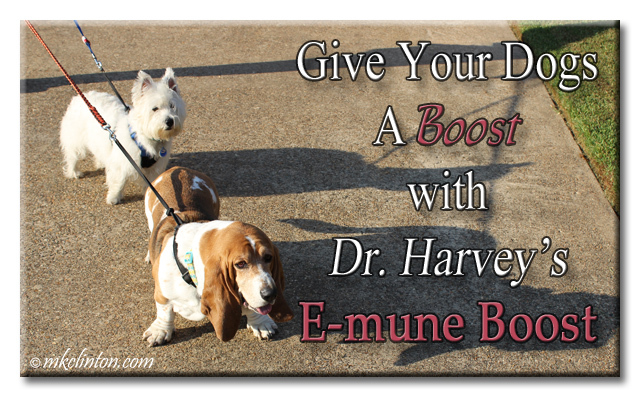 Dr. Harvey’s loves my readers and wants three of you to try their E-mune Boost for your dog. All you need to do is fill out this easy Rafflecopter entry. Don’t forget to come back to tweet and get your free entry daily! What a great product! Must keep my Princess furs in top condition! This sounds like a terrific product and one that we just may be interested in! Thanks for a great review! We currently supplement with SomaPet! That stuff looks yummy. 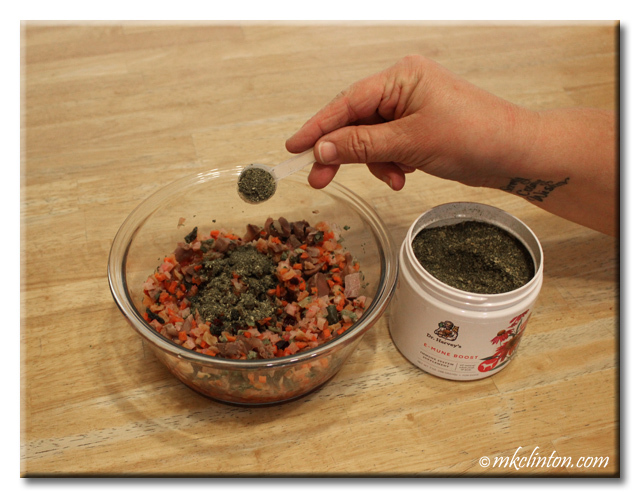 Sometimes, Mom puts some coconut oil, pumpkin, or flax meal on my foods. That stuff has LOTS of goodies. We take some fish oil and joint stuff, but this sounds real healthy! No I have not found one the dogs like and not turn up their nose. Skipper has skin allergies. I need to look into Dr, Harvey's E-Mune Boost. Thanks for the review and giveaway. Thank you for the information you gave us!!! Sounds like a great product to keep our dogs healthy this winter!!! Have to try it too. Wow- what a great product! Sounds like some good stuff. We're glad it's keeping Bentley and Pierre happy and healthy. We have our dogs on joint supplements. We want to keep them happy and healthy. This sounds like very good stuffs! Would love to give this a try! Ruby takes their ortho-flex supplement and really seems to help. My one dog is on some Chinese herbs, but other than that, no.